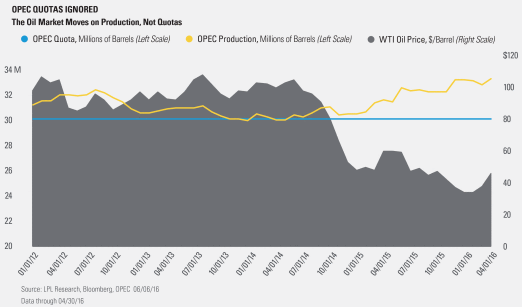 OPEC: Dead, Comatose, or Irrelevant? Last week’s OPEC (Organization of the Petroleum Exporting Countries) meeting was a microcosm of its recent history. Lots of talk, little action—and most importantly, little impact. Looking at recent history, it’s hard to suggest that OPEC really controls much of anything; it has become more of a think tank for oil producers than an actual mechanism for controlling oil prices. Why OPEC has lost so much control is a much debated topic. The primary reason is due to alternative sources of energy. These include not just shale oil, but oil sands, natural gas, and the increasing efficiency of sources like solar power. These other sources mean that Saudi Arabia is losing its status as the “swing producer” of oil, being replaced largely by Texas. Another reason is that almost all OPEC nations are likely pumping oil at their maximum rate, and even then, at rates that are not sustainable. The exceptions to this are Iran, which had been under sanctions, and nations that are in major political upheaval—primarily Iraq and Libya. OPEC nations are also pumping oil at much higher levels than their official quotas (see the chart below). This lack of flexibility by OPEC members makes Saudi Arabia not only the default leader of the cartel, but the only nation in it that matters. Therefore, OPEC now effectively serves Saudi Arabia’s interests only. Does this mean that OPEC can never regain control over the oil market? Not necessarily, but its members would have to attain a higher level of unity and a willingness of its leaders (particularly Saudi Arabia) to place the needs of the group over its own desires. At least twice in the past year, and most recently last week, they have not shown a willingness to do so. Commodity-linked investments may be more volatile and less liquid than the underlying instruments or measures, and their value may be affected by the performance of the overall commodities baskets as well as weather, geopolitical events, and regulatory developments.